Base Jump Bungy! Bounce and soar to over 8metres high, an exhilarating experience. Great for day and night events. Riders are harnessed into the Base Jump Bungy and hooked onto super stretchy elastic cables. Then, just start jumping. With a little practice, you’ll be spinning and back flipping in no time. Our rides and catering facilities appear annually at the Brisbane RNA Show and The Royal Easter Show. We also appear at the Coolangatta Beach Carnival in the September and Christmas school holidays. We are also very experienced in amusement hire Brisbane for smaller events too such as Festivals, Fetes and Corporate Events. We have extensive knowledge and experience in event management and supply including all areas of amusement ride hire, catering, marquee set-up and amusements. Coney Fair Amusements also have a proven track record with all our amusement ride hire safety systems and protocols. 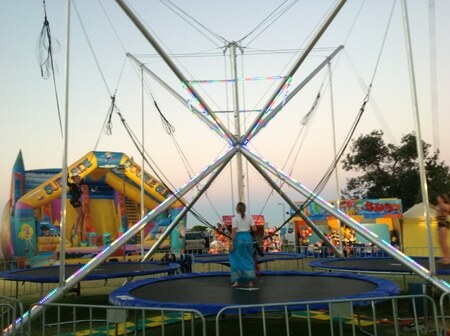 We have the safest amusement hire Brisbane has to offer, when you book us for your event’s amusement rides, you know you’re getting quality service and safe amusement rides, hired from the experts.